Dental Implants in Northwest Houston | Why Dental Implants? If you struggle with missing teeth, or if you’re looking to replace damaged or decaying teeth, our Cypress dentist has solutions. With technological advancements improving dental options every year, teeth replacement procedures improve your smile and oral function. Bailey Dental Group offers several options for teeth replacement, which include single dental implants and implant-supported dentures and bridges. Dental implants mimic the function of an original tooth. The implants are surgically placed into the jawbone and integrate with the bone through a process called osseointegration, replicating the roots of the tooth. The implant posts serve as a foundation for a replacement tooth or set of teeth using a single crown, a bridge or denture. Dental implant supported restorations look and feel like your natural teeth. 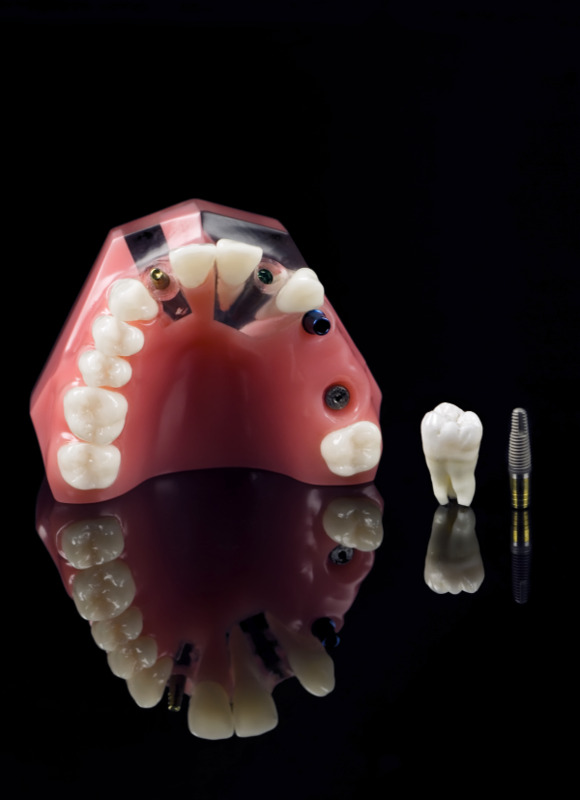 Dental implants come with some advantages over their traditional counterparts: bridges and dentures. The dental implant itself stabilizes by bonding with the bone in your jaw, preventing deterioration of bone and shifting of teeth towards gaps. Furthermore, dental implants look and feel natural compared to other teeth replacement options. When it comes to longevity, dental implants offer a long-lasting solution for teeth replacement. Unlike crowns and bridges, that typically have to be repaired or replaced every few years, dental implants can last decades or longer before needing restoration for wear. So while the procedure may appear to cost more upfront, dental implants are the more affordable tooth replacement solution over time. At Bailey Dental Group we believe in offering our patients the best. We use BioHorizons dental implants, an innovative implant system that has proven to provide highly successful and long lasting implant treatment. Dr. Bailey offers patients quality options to sufficiently treat their individual needs. Dr. Bailey also takes the time to talk his patients through treatments options, weighing the pros and cons of each, before encouraging decisions. Bailey Dental Group prides itself on providing the best service and care to our patients. If you think a dental implant might be right for you, contact us at our Northwest Houston dental practice in Cypress, Texas today to see how we can help.